‘Tis the season for giving! This week marks the traditional start of the holiday shopping season, including Small Business Saturday on November 24. If you’re planning to make purchases this time of year (and really any time! 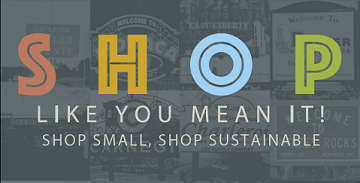 ), shop small AND sustainable. On average, 48% of each purchase at a local independent business is recirculated locally, compared to less than 14% at chain stores. Local businesses often offer a more personal and unique shopping experience and are more likely to be invested in the community. Of the nearly 100 formally designated Sustainable Small Businesses in southwestern Pennsylvania, 90% have rehabilitated an existing space or structure instead of locating in a newly constructed building. These same businesses are located in historic mixed-use, walkable business districts and 85% are active in the community by advocating for such improvements as attractive sidewalks, trees and benches, and helping to make the area safer for pedestrians and bicyclists. Sustainable Small Businesses commit to being responsible stewards of the environment and community. While you’re out and about, consider stopping at one of the more than 125 Sustainable Pittsburgh Restaurants for a bite to eat. Designated restaurants demonstrate their commitment to sustainability with actions like donating food, sourcing locally, providing healthy options, and reducing or recycling their waste. More than 1/3 of these restaurants are building the local farming economy by sourcing at least half of in-season produce from within a 150 mile radius, and this same percentage is using renewable energy sources to cut down on carbon emissions. This holiday season, help support sustainable businesses in the southwestern Pennsylvania region!